Amateur Radio volunteers were at the ready as a storm of historic proportions over the January 23-24 weekend dropped up to 3-1/2 feet of snow, some of it on states not used to seeing much snow at all. There really is a Winter Field Day, and this year, it takes place over the January 30-31 weekend, sponsored by the Winter Field Day Association (WFDA). The annual event’s stated purpose is to encourage emergency operating preparedness in the winter, but it’s also a great opportunity to operate in the great outdoors. After managing to recover from the effects of a fierce South Atlantic storm, an emergency resulting from the storm has forced the VP8STI team back to their transport vessel, the R/V Braveheart. Chief Pilot Station Toni Gonzalez, EA5RM, said the Braveheart’s skipper, Nigel Jolly, declared an emergency on January 25 at 2120 UTC, ordering the VP8STI team to cease all operations and return to the ship. The balloon PS-58 launched in Melbourne four weeks ago is floating slowly just south of the equator near South America, as it edges easterly. Jim Linton VK3PC says keeping track of the flight are Ken ZS6KN in Pretoria South Africa, Jim W8AC in Ohio and John AT4AT of Virginia USA. For decades Don's Hobby store was a dream spot for model railroad enthusiasts, amateur and professional artists, model builders, coin and stamp collectors and crafters. Don and Julia Schlichting moved to Mankato from Austin nearly 50 years ago and opened the Big Dollar Store in the building that now houses Blue Bricks. A federally licensed amateur radio operator said he plans to sue the city for harassment in regards to a radio tower he was forced to remove. Adams Street resident Karl Reed said the city violated his First Amendment rights and failed to give him due process when it threatened to fine his landlord $2, 500 a day if the tower was not removed. 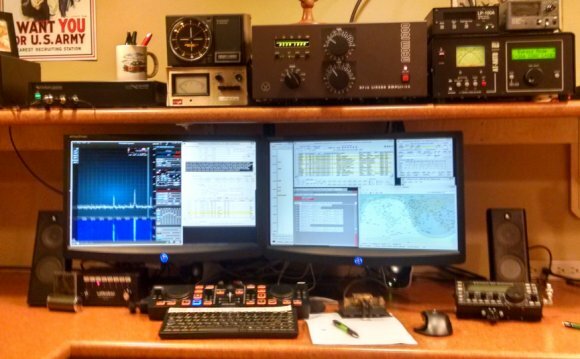 The Southeastern VHF Society (SVHFS), North East Weak Signal Group (NEWS) and Mount Airy VHF Radio Club (Pack Rats) are cosponsoring a VHF Super Conference, hosted by the Grid Pirates Contest Group (K8GP) and Directive Systems and Engineering. The conference will take place April 15-17 in Sterling, Virginia. The early days of electricity appear to have been a cutthroat time. While academics were busy uncovering the mysteries of electromagnetism, bands of entrepreneurs were waiting to pounce on the pure science and engineer solutions to problems that didn’t even exist yet, but could no doubt turn into profitable ventures. We’ve all heard of the epic battles between Edison and Tesla and Westinghouse, and even with the benefit of more than a century of hindsight it’s hard to tell who did what to whom. But another conflict was brewing at the turn of 19th century, this time between an Indian polymath and an Italian nobleman, and it would determine who got credit for laying the foundations for the key technology of the 20th century - radio. VP8 DXpedition Co-Leader Paul Ewing, N6PSE, said the VP8STI team is been on the air from Southern Thule Island with three stations, and he expects more to be ready soon. The DXpeditioners arrived on January 17, not without complications. As expected, the pileups have been hectic. SDRplay of Wakefield, the 18-month-old software defined radio specialist, is now shipping its $149 software defined radio (SDR) receiver in quantities of 1, 000 a month. Inspired by the SDR capabilities that even a simple 8-bit TV dongle can perform, SDRplay had the idea of partnering with Mirics to take their 12-bit wideband broadcast chipset and to re-purpose it for the hobbyist market. This Week in Amateur Radio International is a weekly radio show devoted to amateur radio and other communication technology related topics. It is aired Sundays on shortwave via WBCQ (SW) and also available as a podcast at Blogspot.